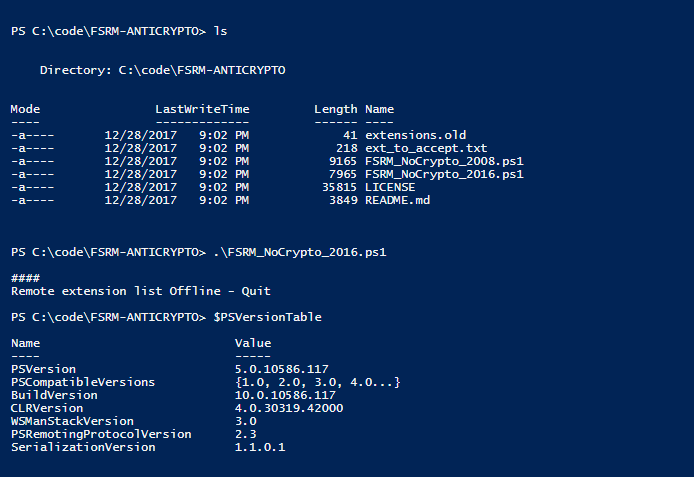 Browse: Home / FSRM-ANTICRYPTO : Protect servers against crypto attacks. Configuring FSRM make impossible to users to write files with forbiden extensions. 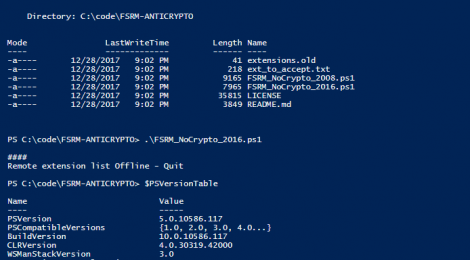 So We use FSRM to avoid encrypted files to be saved as the extension used by the Crypto Process is Known. Those scripts and howto are given as is. Use at your own risck. I will take no responsability for that. This work is heavily based on Kinomakino and Nexxai on Github. Big hug! Also Thanks to Jpelectron who gave me the idea to go further. 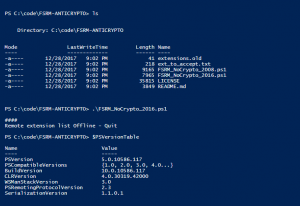 git clone https://github.com/davidande/FSRM-ANTICRYPTO && cd FSRM-ANTICRYPTO 1- Installation of FSRM Role Install FSRM on Yor server: Add-Role->File Service ->File Server Ressource Manager As sometime Windows file manager is configured in Case sensitive, you have to configure it by checking HKEY_LOCAL_MACHINE\SYSTEM\CurrentControlSet\Control\Session Manager\Kernel obcaseinsensitive is set to 1 2- Installation of script Download the FSRMNOCRYPTO.ZIP and UnZip only files to C:\FSRMNOCRYPTO so C:\FSRMNOCRYPTO contain: FSRM_NoCrypto_2008.ps1 -> to be used with Windows Server 2008 and 2008 R2 FSRM_NoCrypto_2016.ps1 -> to be used with Windows Server 2012, 2012 R2 and 2016 extensions.old -> used to compare local en remote extensions list ext_to_accept.txt -> is use to input all the extensions that are in the blocked list but You want to accept Readme.md -> this file Licence 3- Execute the script First check that .NET and ASP.NET are installed (check fonctionnalities) Second check Set-ExecutionPolicy to acces execution of nonsigned scripts (bypass or remotesigned) Start the script in a Powershell session with admin right. First time You should see some errors. No problem it's only cause by deleting objects that are not yet created. To check if everything is ok, just empty the extensions.old and lunch the script again. This time You should See no error 4- Drive and extension exclusion. As some program use certain type of extension that are known to be ine the ransomware list, You can put the list of extensions to bypass the FSRM blocking filter in the file est_to_accept.txt For the drive extension You can exclude 2 from bloking directly in the script. 5- Task to update de file This scripts can be add as a task to check newer version of extensions list : program: c:\windows\system32\windowsPowerShell\v1.0\Powershell.exe Arguments to add: -noprofile -executionpolicy Unrestricted -file "where is this script" default "C:\FSRMNOCRYPTO\FSRM_NoCrypto_20**.ps1"
4- Drive and extension exclusion. As some program use certain type of extension that are known to be ine the ransomware list, You can put the list of extensions to bypass the FSRM blocking filter in the file est_to_accept.txt For the drive extension You can exclude 2 from bloking directly in the script. 5- Task to update de file This scripts can be add as a task to check newer version of extensions list : program: c:\windows\system32\windowsPowerShell\v1.0\Powershell.exe Arguments to add: -noprofile -executionpolicy Unrestricted -file "where is this script" default "C:\FSRMNOCRYPTO\FSRM_NoCrypto_20**.ps1"
← RedGate – Data sorting tool for penetration testers.